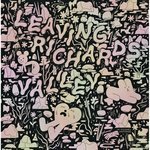 Charles Burns has been creating and publishing his own unique brand of finely polished comics of life on the edge of sanity for well over thirty years. He forged an instantly recognizable pen and ink style from his earliest outings on, one that has influenced legions of comickers and illustrators (and writers and filmmakers) around the globe. He was a key contributor to RAW Magazine and helped redefine, as well as expand the boundaries of, comics during the 1980s. He has produced numerous genre-defying works such as El Borbah, Big Baby, and Black Hole – and he's still going strong! 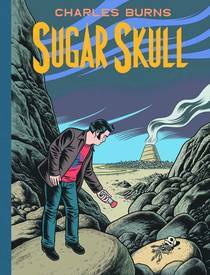 Sugar Skull is the third and final volume in the trilogy that began with X'ed Out and continued inThe Hive. While this trilogy has taken Burns over five years to complete, that is just the tip of the iceberg, for it has spent almost a lifetime gestating. Its earliest roots are in Burns's childhood love for / obsession with Hergé's classic series of TinTin albums. This is the frame onto which Burns stretches his canvas and paints an elaborate, multifaceted and multidimensional (multiversal?) portrait of fantastic inner landscapes as seen through his mind's eye. Drug addled confusion mingles with late nights, odd ball performers, and punk rock femme fatales, precipitating failures in psychological integration which turn reality inside out, wherein comic book inspired dreams become real. It doesn't get any better than this.